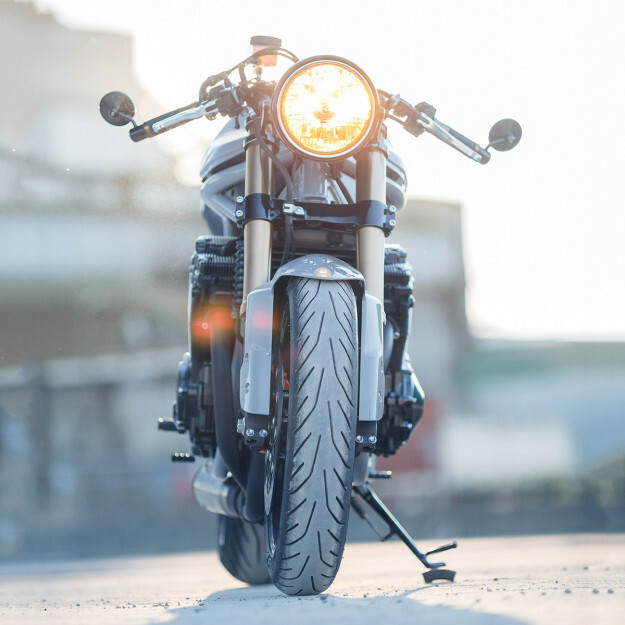 There are some motorcycles that lend themselves easily to cafe racer conversions—like the Hinckley Bonneville, or the Honda CB750. You’ll find a plethora of both in the EXIF archives. Then there are bikes that tend to be overlooked, or in some cases, avoided. 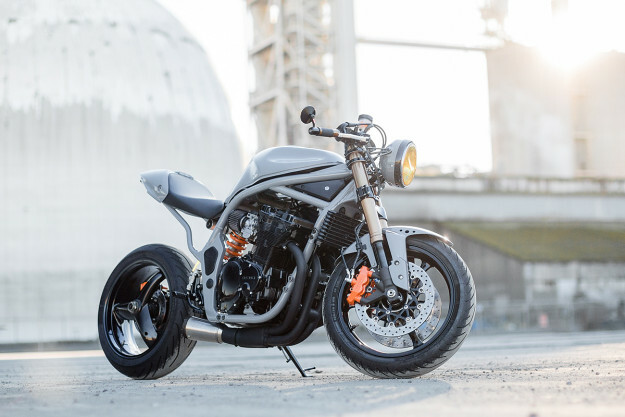 The Suzuki Bandit falls into the latter category. 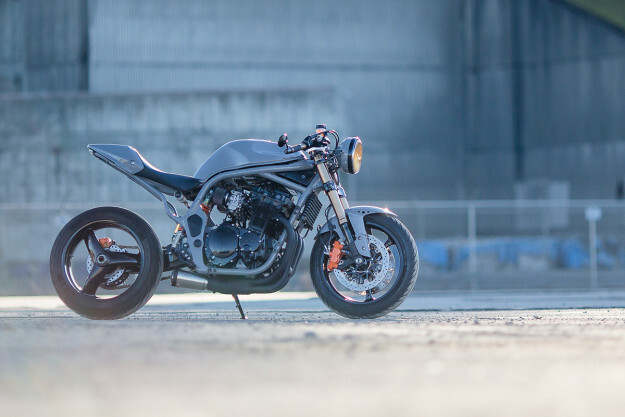 Despite being a naked sports bike, which pretty much sums up what cafe racers are all about, it’s hard to look past the dated ’90s styling and plastic bodywork. Then there’s the oddly shaped half fairing given to the ‘S’ variants. It’s almost impossible to see how the Bandit could ever be a cafe candidate. Darrick Bartley didn’t see it that way though. What the Washington State man saw in his 1996 Bandit 600S was a strong performing engine, a good-looking tubular frame and loads of potential. But he knew he had his work cut out. 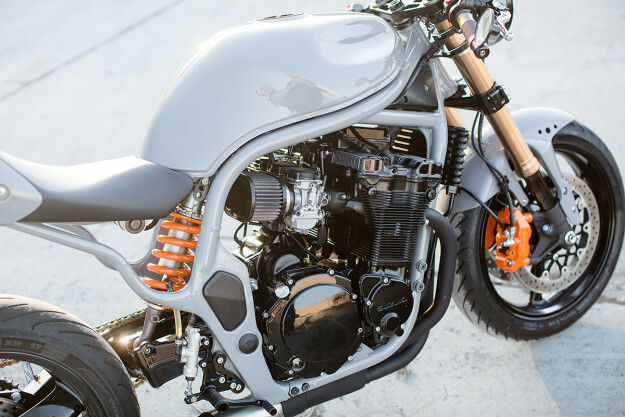 His goal with the build was simple enough: tear the Bandit 600 apart and turn it into a bare bones, nimble and modern cafe racer that would suit as a daily rider. 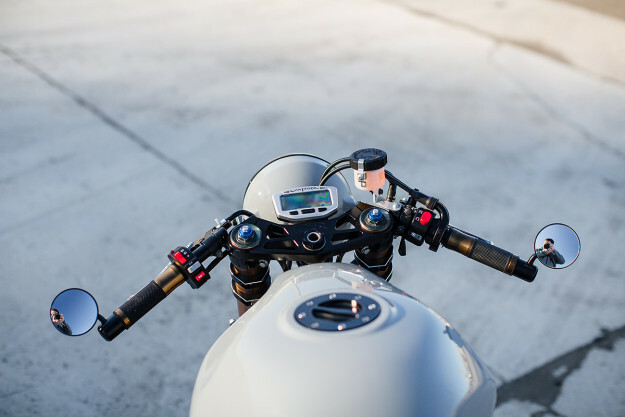 During his search for parts, Darrick stumbled across a Ducati Monster tail end, which fit snugly to the rear of the Bandit’s fuel tank. With the bike now in pieces, he enlisted the help of Rob Hancock of Flipside Customs to tackle the framework. 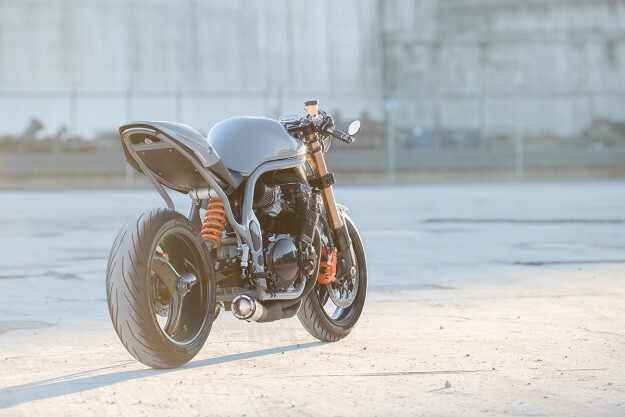 After removing the stock subframe, Rob welded in a curvaceous tail to complement the lines of the backbone and support the Monster seat and cowl. 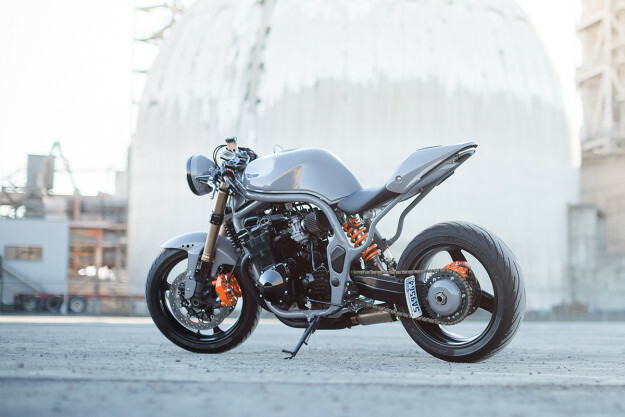 Darrick then sourced a single-sided swingarm from a Honda NT650 Hawk, so Rob used a water jet cutter to fabricate new mounts for the rear shock and engine. 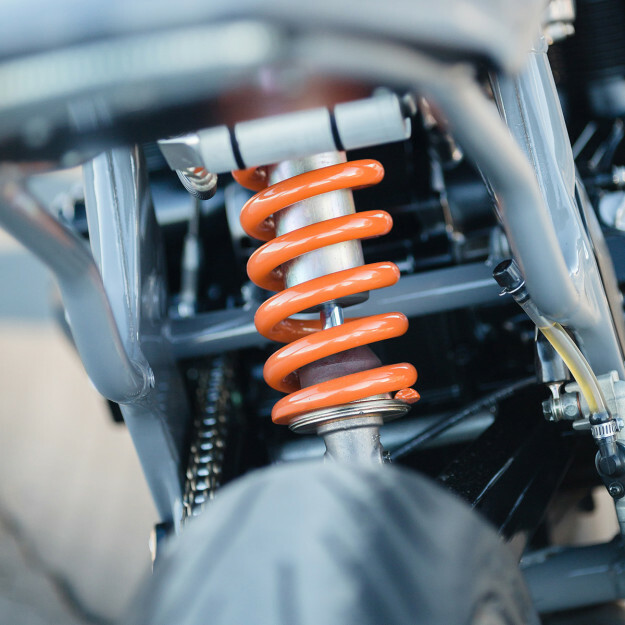 To give the bike a more aggressive stance, Darrick bolted in the Showa monoshock from a Triumph Speed Triple—which he’s upgraded using a Hyperco spring. At the pointy end are a set of 2008-spec Suzuki GSX-R1000 forks, and a Triumph Speed Triple front wheel. To declutter the top clamp, Darrick’s replaced the Bandit’s mechanical instrument cluster with a single digital Trail Tech Vapor gauge. 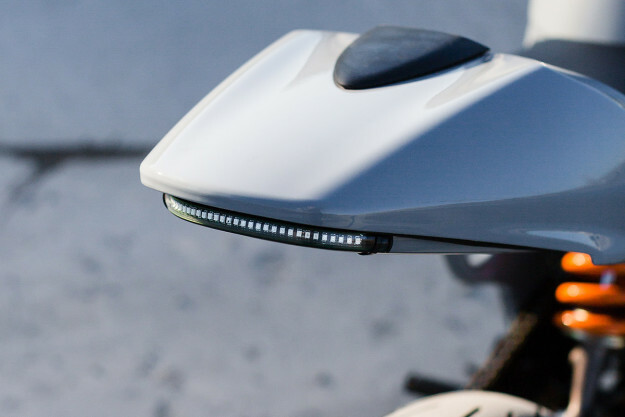 Clip-on bars with discreet bar-end mirrors keep the cockpit clean. Hidden inside the seat and cowl are a lithium battery and the electrics, which have been wired to a custom-made harness. Finding a fuel tank to follow the lines of the Bandit’s frame would be near impossible. So Darrick kept the stock tank—but stripped off the paint and badges in preparation for a new color scheme. With the help of friend Steve Marks, the frame and bodywork are now finished in Audi’s Nardo Grey color, with orange highlights to match the Hyperco spring. The engine was given a fresh coat of gloss black, and a gold o-ring chain added to match the anodized front end. With the Bandit finally looking the part, it was time to improve performance. The air box was removed and twin K&N pod filters were mounted to the mouths of the rebuilt carbs. They’ve been tuned using a Stage 2 jet kit and a +5° timing advancer. 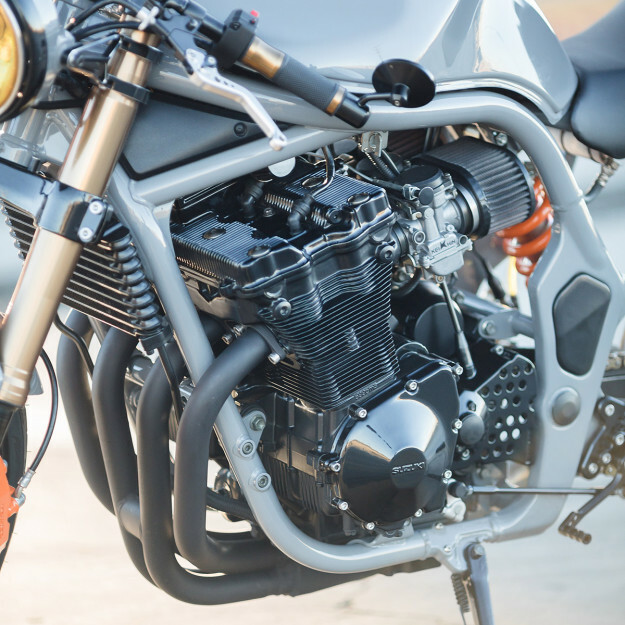 The exhaust headers are standard, but a single SuperTrapp muffler frees up the flow—and adds more bite to the bark. The bike now weighs in at 40 pounds less than its former self. And the suspension and riding position changes have turned it into a whole new kind of beast. 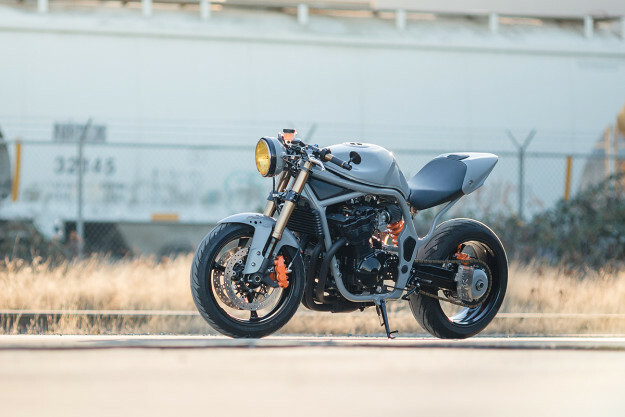 As a modern take on cafe racer styling, Darrick’s Bandit has hit the nail on the head.